801, Broadway Business Centre Opp, Mayor's Bungalow Law Garden, Ellis Bridge Ahmedabad - 380006, Gujarat India. Since time immemorial, the form of Lifespaces has evolved from a simple tree - house to present lavish creations. But the soul and purpose of creations is the same. And this forms the nucleus of Venus Lifespace Creators. We believe not just in tradition, but innovation that complements our timeless structures applauded by the industry. Our core values of business ethics, customer focus and total quality has made us a formidable business house and also everyone's favourite. Our Landmark creations have won us not only accolades but has also earned us creative awards at GIHED too. We have been the proud recipient of ISO 14001:2004 Certification for Environmental Management and ISO 9001:2008 Certification for Management Processes. 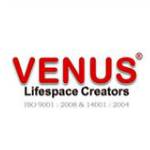 Venus has been unlocking the door to splendid real estate creations with some of the finest Lifespaces. Rajesh Vaswani, ED Venus Group inaugurated a smart classroom with the Hon. Chief Minister of Gujarat Shri Vijay Rupaniji in Gandhinagar.